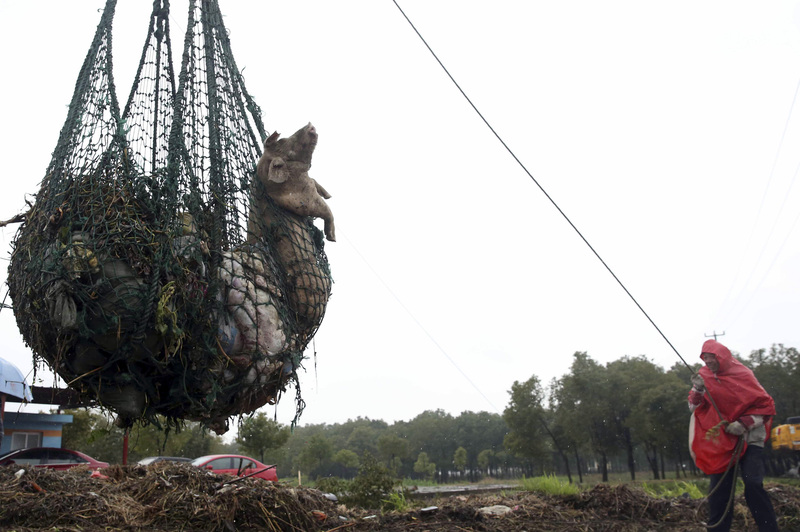 BEIJING Authorities recovered hundreds more dead pigs from a river that provides drinking water to Shanghai, China's financial hub, bringing the total to more than 6,600 since last Friday. Pictures of swollen and rotting carcasses in the Huangpu river have worried many residents, but officials say the water supply remains safe. The surge in dumping of dead pigs - believed to be from swine farms in the upstream Jiaxing area of neighboring Zhejiang province - has followed police campaigns against the sale of pork products made from diseased pigs. On Wednesday, a Zhejiang court sentenced 46 people to jail for producing unsafe pork from sick pigs that they had acquired and slaughtered between 2010 and 2012. The official Xinhua News Agency said police in the city of Wenling had seized 13,708 pounds of diseased pork. In another operation last year, police in Jiaxing broke up a gang that acquired and slaughtered diseased pigs. Provincial authorities said police arrested 12 suspects and confiscated nearly 12 tons of tainted pork. On Wednesday, the Shanghai government said the city will continue to monitor water quality and test for viruses including porcine circovirus. It said the city disinfected the carcasses before burying some and incinerating others.